There's no denying it, I've crossed over to the dark side. I'm a mom now, and it appears that I'm now willing to post personal details about my body on the internet. Something no one prepared me for when I was pregnant was how hard breastfeeding would be. 6 weeks in, I'm still fighting like mad to make it work and I'm still not sure it will. In the meantime, I'm holding onto hope and coping the only way I know how: with cookies. I know what you're probably thinking: lactation cookies?! Really, Amy? Hey, I'm willing to give anything a try at this point if it might help us, even if it's an old wives' tale I read about on the internet. I've done it before and I'll do it again (the labor cake didn't work, by the way. Shocker!). It's not like this is going to turn you into a milk cow if you're not in a position in life where you'd like to increase your milk supply. But for those of us looking to promote healthy lactation, why not, right? Even though the recipe calls for some slightly unusual ingredients, these actually taste really good. 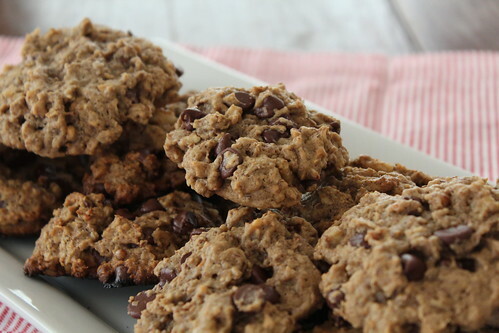 Like an oatmeal chocolate chip cookie with a slightly nutty extra kick. You can find more info about the recipe and rationale behind the ingredients here. 1. Preheat oven to 350. Combine flour, baking soda, salt, and cinnamon in a medium bowl. 2. With an electric mixer in a large bowl, beat peanut butter, butter, flaxseed, brewer's yeast, sugars, and water until creamy. Beat in eggs until well combined. Stir in chocolate chips and nuts until well distributed, and then stir in oats in several additions. 3. Drop by heaping tablespoonfuls onto greased cookie sheets and flatten each one slightly. Bake on the middle oven rack for 12 minutes and allow to cool completely before serving. Lactation cookies! They're a new mama's special treat, because you can tell everyone else that if they eat them, they'll start lactating (i.e. hands off)! It was really helpful for me when it came to supply issues, infections, and support (you never know what article or advice might just keep you going for one more day). Good luck!! @Jen Yes! They were really tasty. I changed some of the ingredients (used white instead of whole wheat flour, chunky PB instead of smooth) to help them taste a little better. Love these cookies!!! Sure wish I knew about them back when I was lactating!!! Enjoy every cookie and don't worry about the calories! Remember you're burning 500 calories a day by just sitting around making milk! I'm sad I can no longer say, "I make milk, what's your super power?"